Jun 30, 2014 | By CENS | KUNTECH INTERNATIONAL CORP. 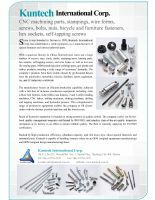 Since it was founded in Taiwan in 1989, Kuntech International Corp. has established a solid reputation as a manufacturer of special fasteners and various industrial parts. With a spacious factory in China, Kuntech now turns out a large number of screws, nuts, studs, shafts, stamping parts, turning parts, hex sockets, self-tapping screws, and wire forms, as well as lost-wax die-casting parts, MIM (metal injection molding) parts, and plastic and rubber products, meeting a wide range of customers' demands. The company's products have been widely chosen by professional buyers from the automotive, motorbike, bicycle, furniture, sports equipment, toy, and 3C industries worldwide. The manufacturer boasts an efficient production capability achieved with a full line of in-house production equipment including 4-die 4-blow bolt formers, 6-die 6-blow nut formers, 2 and 3-roller treading machines, CNC lathes, milling machines, slotting machines, drilling and tapping machines, and hydraulic presses. This comprehensive range of production equipment enables the company to fill clients' orders with the shortest possible lead time and the lowest costs. Much of Kuntech's reputation is founded on strong attention to quality control. The company carries out by-the-book quality management measures certificated by ISO-9001, and employs state-of-the-art quality inspection instrument at its factory in an effort to ensure reliable quality. The firm is currently applying for TS16949 certification. Backed by high production efficiency, abundant capacity, and rich know-how about special fasteners and industrial parts, Kuntech is capable of handling contract orders on an OEM (original equipment manufacturing) and ODM (original design manufacturing) basis.